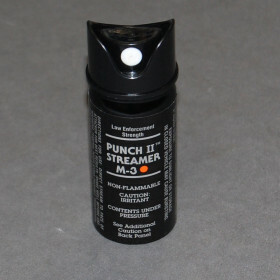 OC Punch II Stream Spray (LE Only) » Protective Solutions, Inc.
Punch II by Aerko International. 5% OC, 2 million s.h.u. 2 oz size. Highly effective for clearing rooms or structures. Non-toxic, non-flammable, includes 24-hour ultra-violet dye for identification.